Striving for something can be a healthy and positive attribute; it's good to aim high. But sometimes whatever we do just isn't good enough; we want to be too perfect and start setting unrealistic goals. 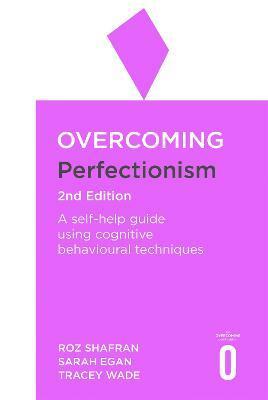 Such high levels of perfectionism, often driven by low self-esteem, can turn against success and develop into unhealthy obsession, triggering serious mental-health problems, such as anxiety, depression and eating disorders. Cognitive behavioural therapy (CBT), on which this self-help book is based, has been found to be a highly effective treatment and provides relief from that disabling sense of not being good enough. ROZ SHAFRAN is professor of translational psychology at the UCL Great Ormond Street Institute of Child Health. SARAH EGAN is a senior research fellow at Curtin University in Perth, Australia and is also the chair of the World Congress of Behavioural and Cognitive Therapies committee. TRACEY WADE is a professor at the school of psychology at Flinders University in Adelaide, Australia. ROZ SHAFRAN is professor of translational psychology at the UCL Great Ormond Street Institute of Child Health. She has worked at Oxford on the treatment of eating disorders using CBT. She is the author of Cognitive Behavioural Processes Across Psychological Disorders: A Transdiagnostic Approach to Research and Treatment (OUP). Dr SARAH EGAN is a senior research fellow at Curtin University in Perth, Australia and is also the chair of the World Congress of Behavioural and Cognitive Therapies committee. She also continues to work as a clinical psychologist in private practice. Professor TRACEY WADE teaches at the school of psychology at Flinders University in Adelaide, Australia. She is also Course Director of the university's Clinical Postgraduate training programmes and has worked as a clinician treating eating disorders for the past twenty years.